Research and innovation offer significant opportunities for Mediterranean Partner Countries (MPCs) to develop and exploit their assets for the benefit of their economies and of their peoples, as drivers of economic and social development. 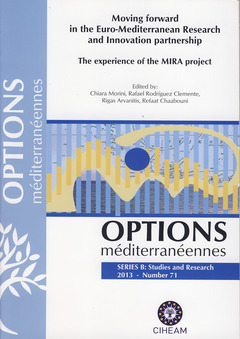 In this spirit, this book presents the main outcomes of the MIRA project, a coordination and support action acting as a “think-tank” and an implementation actor of the Euro-Mediterranean Cooperation in Science and Innovation in the Mediterranean area. The book presents the efforts, analysis, reflections on the past and future of EU - MPC cooperation in research and technology development, as well as models and challenges of structuring this cooperation, and a compilation of the lessons learnt along the development of the project. It contains a reflection on policy aspects, analysis and concrete proposals to support the implementation of a future road map of scientific and innovation cooperation for the mutual benefits . The book reflects the internal and external dialogue of the MIRA project consortium on the targeted objective of supporting the EU-MPC dialogue on scientific and innovation cooperation. - What scenarios for the Euro-Mediterranean in 2030 in the wake of the Arab spring? Ayadi R., Sessa C.
Arvanitis R., Rodriguez Clemente R., El-Zoheiry A.H.
Rossano M., Bonfim J., Chaabouni R., Bonas G.
El Fellah R., El Majid Z.
Pancera A., Papageorgiou K., Boutros S., Bousselmi L., Abdelhak S., Al-Bawab A.
Gaillard A.-M., Canesse A.-A., Gaillard J., Arvanitis R.
Arvanitis R., Atweh R., M'Henni H.
Rossano M., Morini C., El Fellah R.
Noetzel R., Morini C., El-Zoheiry A.H.
Muñoz M., Siller C., Bossi M., Le Meur F., Pohl K.
Semeraro M., Giannelli M., Bogliotti C., El-Zoheiry A.H., Lacirignola C.
Noetzel R., Kunze U., Ditgens B.
Gauci-Borda I., Koc Y., Fysekidis A.
Dagault S., Ziane-Cherif A., Menéndez A.